Baptie, B. 2017. 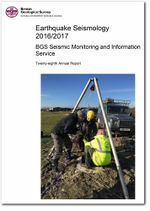 Earthquake seismology 2016/2017 - BGS seismic monitoring and information service. British Geological Survey Internal Report, OR/17/033. This page was last modified on 14 December 2017, at 12:50.